Location: Home › Music Articles › Angelic Gospel Singers: Margaret Allison still singing "Touch Me, Lord Jesus"
Angelic Gospel Singers: Margaret Allison still singing "Touch Me, Lord Jesus"
The 1950s are often thought of as the golden age of gospel but it was a record made in 1949 "Touch Me, Lord Jesus" by the Angelic Gospel Singers that was one of the biggest hits of the era. A bluesy downhome hymn "Touch Me, Lord Jesus" was written by gospel stalwart Lucie Campbell but it was Philadelphia's Angelic Gospel Singers' rough, rural sounding rendition of the passionate devotional lyric ("Touch me, touch me Lord Jesus, with thy hand of mercy/Make each throbbing heartbeat feel thy power divine") that ensured that when Gotham Records released the Angelic's version in 1949 it was picked up by black radio stations across the country reaching Billboard's R&B Top 20 and selling well for years to come. Ernie Young of Ernie's Record Mart, broadcast over WLAC, the principal national gospel radio programme during the 1950s, used the track as its theme tune for over a decade. The central figure around which the Angelic Gospel Singers were to forge a decades-long gospel career was singer, pianist and composer Margaret Wells Allison. Margaret was born on 20th September 1921 in McCormick, South Carolina, 50 miles north of August, Georgia. When she was four, Allison's family moved to Philadelphia so that her father could find a better job. They prospered until the Great Depression, when the family went on welfare briefly until her father secured employment with the Works Progress Administration (WPA). Allison's parents attended the Little Temple Pentecostal Church in Philadelphia and although she never sang in a choir, it was the training camp for most gospel singers (Pentecostal churches did not have choirs until the late 1940s). Allison was fascinated by the congregation's joyous gospel singing. Allison studied piano for a short time when she was 12 and transferred her membership to the B M Oakley Memorial Church Of God In Christ (the church that another gospel giant, Marion Williams, would later join) where she had an opportunity to play for services. By 1942 the 21 year old Allison joined a gospel choir, the Spiritual Echoes. They toured Philadelphia's churches on Sunday gaining a citywide following. Then in 1944 Margaret had a dream in which her pastor asked her why she hadn't formed her own group. When she answered that she didn't know how to launch a group, her pastor replied, "The Lord will bless you in whatever you do, as long as you keep him first." The name the Angelic Gospel Singers came to Margaret in the same dream. So Allison recruited two South Carolinians who had also relocated to Philadelphia - Lucille Shird, originally of Ashville, and Ella Mae Morris, a native of Greenville. The fourth member was her sister, Josephine McDowell. In 1947 the group signed to Philadelphia's Gotham Records. As Margaret recounted in Bil Carpenter's book Uncloudy Day: The Gospel Music Encyclopedia, "There was a promoter here named Otis Jackson. He suggested that we go to this company and let them hear us. So we went and the man who owned the company said, 'I want you to do something no one else has recorded, with your own arrangement, because I want you to establish your own sound.' So I did 'Touch Me, Lord Jesus'." The song "Touch Me, Lord Jesus" has since become a gospel standard recorded by such acts as Marie Knight, LaVern Baker and Jessy Dixon. But it was Margaret Allison's arrangement of the song which caught the ear of 1949's gospel radio listeners. In his book The Golden Age Of Gospel Horace Clarence Boyer described how the Angelic Gospel Singers "celebrated the old fashioned Southern style of church music, gospel and hymns in which elements of slave singing were quite prominent: percussive attacks, sliding from one pitch to another, vocal interjections by each member of the group and repetition of any portion of the song that struck a spiritual chord." By 1945 the tours of such groups as the Sallie Martin Singers (conducting singing revivals) had made this downhome gospel style seem dated; however, many gospel fans still loved it. Allison built her new group on the old-time sound. Not only was the vocal style distinctly old-time but Allison's piano gave the voices perfect support, described by Horace Clarence Boyer as "basic accompaniment doubling the voice parts in the middle of the keyboard, rhythmic licks in the upper portion of the keyboard during the singers' rest periods and percussive attacks with explosive releases at every open space in the rendition." 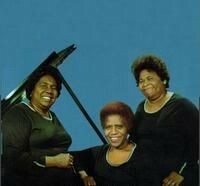 With the phenomenal sales success of "Touch Me, Lord Jesus" the Angelic Gospel Singers began to tour. They played all over the South and in major cities like Chicago, Detroit, Birmingham, Miami, Atlanta and New York. A string of further recordings were released by Gotham and though none sold as well as "Touch Me, Lord Jesus" two, "He Never Has Left Me Alone" and the Christmas song "Glory, Glory To The Newborn King", did become popular with Boyer suggesting that the latter song from 1950 "became as popular in gospel music circles as 'White Christmas' is in the popular music world." 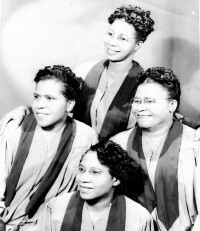 Also popular were the recordings (a total of six sides) and tours that the Angelic Gospel Singers undertook with Philadelphia's pioneering male quartet the Dixie Hummingbirds and it says much for the bluesy power of Margaret Allison that she wasn't eclipsed by the mighty lung power of the Birds' Ira Tucker. In 1951 Bernice Cole of New York City joined the group and in 1953 Lucille Shird left the Angelics to get married. In all the Angelics recorded around 50 tracks for Gotham Records before in 1955 the label was forced to close after running into problems with the Internal Revenue Service for tax evasion. In the words of Bil Carpenter, "Suddenly the Angelics were a hot property and, other than the Ward Singers, one of the few visible female gospel groups of the time. A bidding war ensued for who would pickup the Angelics. They decided on Chess Records in Chicago and cut an album there. Before the album was released Jewel Records in Shreveport bought the masters from Chess. Finally, before Jewel released the album, Nashboro Records in Nashville bought the masters from Jewel and signed the group to a contract that lasted 27 years." Lord Jesus", the new version featuring Allison's testimony. 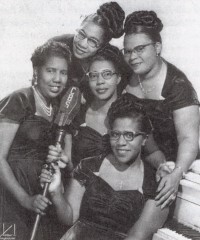 In 1956 Bernice Cole left the group because of illness in her family but the Angelics pushed on touring and recording. In 1961 the first male singer Thomas Mobley joined the group. Also in that year Nashboro released the Angelics album 'My Sweet Home' followed by 1964's 'Songs From The Heart'. Such was the group's grassroots popularity amongst black churchgoers that Margaret Allison was approached by talent scouts Michael Stewart and Ben Zuccor about them managing the group. "They had Mahalia Jackson and they wanted the Angelics," Allison remembered. "They wanted to change our name to the Sweethearts Of America. They weren't going to stop us from singing gospel, but they were going to change our arrangements to be more in tune with the music of the time. They told us our name would be up in bright lights and we'd be in movies. That's how the whole thing was presented to us, but none of us in the group were really interested." So unlike Clara Ward & The Ward Singers who took the showbiz dollar and became a gospel caricature suitable for Las Vegas nightclub entertainment, the Angelic Gospel Singers stayed with their grassroots audience. Nashboro albums like 1967's 'The Best Of The Angelic Gospel Singers', 1968's 'Jesus Paid It All' and 1970's 'Somebody Saved Me' followed. In 1973 Geraldine Morris replaced Thomas Mobley in the group and the albums continued unabated - 1974's 'Jesus Will Never Say No', 1975's 'I'm Bound For Mount Zion', 1976's 'Gotta Find A Better Home', 1978's 'Margaret, Josephine And Bernice' and 1979's 'Come Over Here' though things had significantly slowed down as Allison battled chronic back problems. But the albums kept coming, like 1979's 'Together 34 Years' and 1981's 'I'll Go With You' and even with the changing sound of gospel radio the rough, rural sound of the Angelic Gospel Singers still found a place on plenty of playlists and songs like "My Sweet Home", "He Never Left Me Alone", "Standing On The Highway" and "Sometimes I Feel My Time Ain't Long" were much loved and frequently requested numbers. As Bil Carpenter wrote, "From the 1950s straight through the end of the contract, the Angelics could be counted on to sell 10,000 to 20,000 copies of each LP they released. Those were more than respectable sales for the gospel market of the period." But after their mammoth spell with Nashboro Records by 1982 the Angelic Gospel Singers were keen to leave the label. Explained Margaret Allison, "They wanted us, but I refused to sign. They weren't doing me right by my royalties. By then they had lost all their gospel artists. The company had been sold three times. The last owner wasn't pushing the material, wasn't paying me right [as an artist] and wasn't even paying me my writer's royalties. So, I figured, why should I continue?" The Angelic Gospel Singers signed with Mississippi's Malaco Records in 1983. Predictably, the group kicked off with the 'Touch Me, Lord Jesus' album featuring yet another re-recording of their timeless hit. And the following year the group released '40 Years' celebrating the group's lengthy tenure and featuring songs like "If You Can't Help Me" and "Don't Stop At The Top Of The Hill". Also in 1984 Darryl Richmond (bass guitar) and John Richmond (lead guitar) of Danville, Virginia joined the group. It was the 1986 album 'I've Got Victory' that put the Angelics back on the gospel radio playlists, the album eventually reaching 26 on the Billboard Gospel Chart. By 1987 with yet more personnel changes the group were using the artist credit Margaret Allison & The Angelic Gospel Singers and their 'Out Of The Depths' made 28 on the Gospel Chart with Allison's self-penned songs "Somebody's Praying For Me", "Thank You Lord For One More Day" and "It Could Have Been The Other Way" all becoming gospel radio turntable hits. More albums like 1989's 'Lord You Gave Me Another Chance', 1992's 'He's My Ever Present Help', 1993's 'I'll Leave Again' and 1994's 'I've Weathered The Storm' followed. But, as Bil Carpenter observed, "When Malaco began selling six figures with choirs such as the Georgia Mass and the Mississippi Mass they seemed to lose interest in the Angelics." Today, gospel matriarch Margaret Allison and her singers still sing when she's asked. She commented, "Everywhere I go, people say 'sing "Touch Me, Lord Jesus" if you don't sing nothing else', and I do." the music industry has always been a haven for the corrupt and greedy. who has and still exploit those who have no knowledge or understanding of just how they operate! "Somebody Saved Me" was my altar call, that is the version with Mr. Mobley. I've always wanted to know who was playing the organ in that studio session. They were before their time. I still do some of the riffs from that song, and "You're Gonna Need Somebody On Your Bond." Thank you for a very good chronicle of my grandmothers life! I really appreciate it.